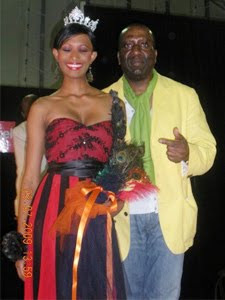 Alleged communication problems between the current Miss World St. Kitts-Nevis, Venetta Zakers, and the current Miss World franchiseholder for the islands, Eversley Liburd, are the reason why St. Kitts and Nevis will not compete in Miss World 2009 in South Africa. Communication dwindled between both, after both complained that each other was not communicating. Liburd said that Zakers did not sent him the Miss World contract before the established deadline, but Zakers said that the organization did not collected the necessary funds for her participation and she was not going to commit before having sponsorship. During the national pageant, the contestants were informed verbally that they would not be allowed to represent any organization, however Zakers was named a Global Goodwill Ambassador and Spokesperson for The Caribbean All-Star Student (CAS). Last May in Barbados, the organizer said he became dissapointed on Zakers' behavior during the Caribbean Fashion Awards. After all the incidents, Liburd said he is no longer committed to sending Zakers to represent the islands in Miss World 2009 in South Africa, and a new show will be organized next year to select a representative for Miss World 2010. Problemas entre la actual Miss World St. Kitts-Nevis, Venetta Zakers, y el actual director nacional de Miss World, Eversley Liburd, es la razón por la cual San Cristóbal y Nieves no competirá en Miss World 2009 en Sudáfrica. La comunicación entre las partes se fue reduciendo, mientras cada uno alegaba que cada parte no se comunicaba entre si. Liburd menciona que Zakers no le envió el contrato de Miss World antes de la fecha límite establecida, pero Zakers reacciona diciendo que no se comprometería hasta que no hubiese garantía de auspiciadores para su participación. Durante el certamen nacional, las candidatas fueron informadas verbalmente de que no podían representar a ninguna organización, pero Zakers fue nombrada como la embajadora global de buena voluntad y portavoz del Caribbean All-Star Student (CAS). En mayo pasado, el director alega que se sintió decepcionado por el comportamiento de Zakers durante los Caribbean Fashion Awards. Luego de estos incidentes, Liburd confirmo que ya no enviará a Zakers a representar las islas en Miss World 2009 y se realizará otro evento el próximo año para seleccionar una representante al Miss World 2010. Special thanks to SKN Vibes!